on the soles of our feet, if we wish to stand and not fall." from someone/thing nearby, if we wish to sit and not slide." 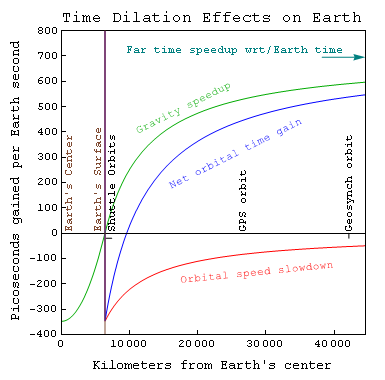 which brought travelers from Earth to Mars (and back?) in the 2015 movie The Martian. 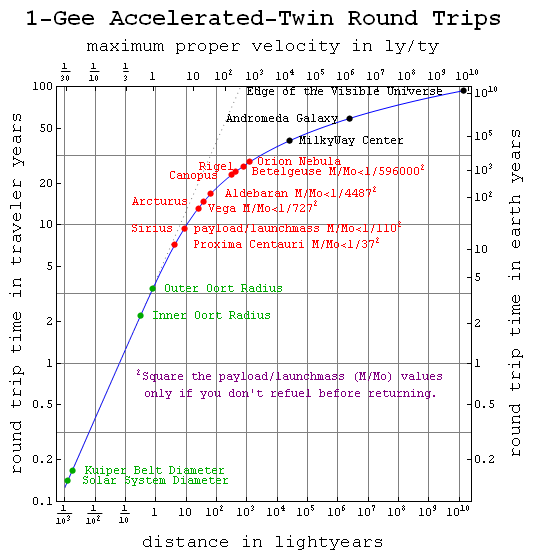 for the 6.6 traveler-year trip between our solar system and the Vega system, about 25 lightyears away. Interesting questions about simultaneity come up in this "practical" setting. What's New: This mobile friendly space on the traveler kinematic, this note about wall clocks on a shuttle to Vega, and this 2016 note on the distinction between proper (i.e. cell-phone detectable) and geometric (i.e. connection-coefficient) forces. 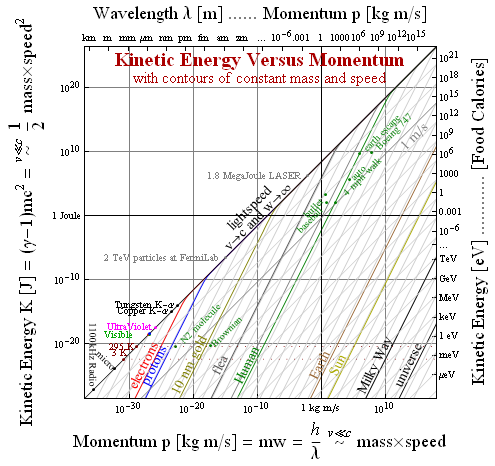 Prior to this, check out these July 2012 notes on a modernized intro to unidirectional motion, these July 2011 voice-thread powered interactive Kahn-academy style tutorials on one map + two clocks and constant acceleration round-trips, as well as this eprint on metric-first & entropy-first approaches. 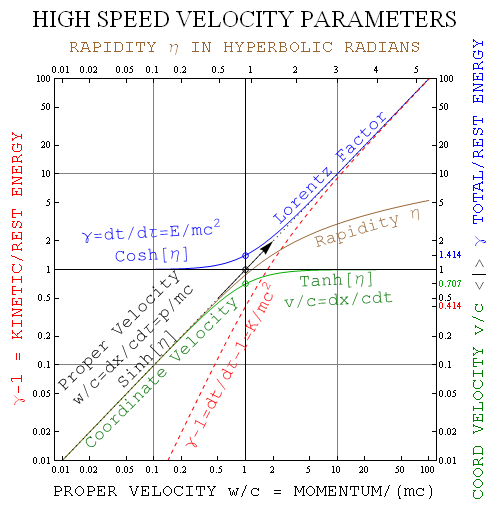 Also check out this working draft of a paper about proper velocity and F≤mα from the metric, plus a couple of summer 2009 x-ct versus ρ-cτ plots of accelerated motion inspired by Dolby and Gull. 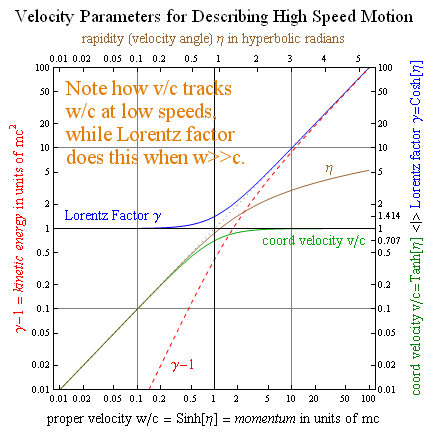 Also check out this earlier plot of Lorentz factor γ-1 versus proper velocity w that inspired the dispersion (KE vs momentum) plot at right. Here are some related images put together for Wikimedia Commons: [1, 2, 3, 4, 5, 6, 7, 8 ]. 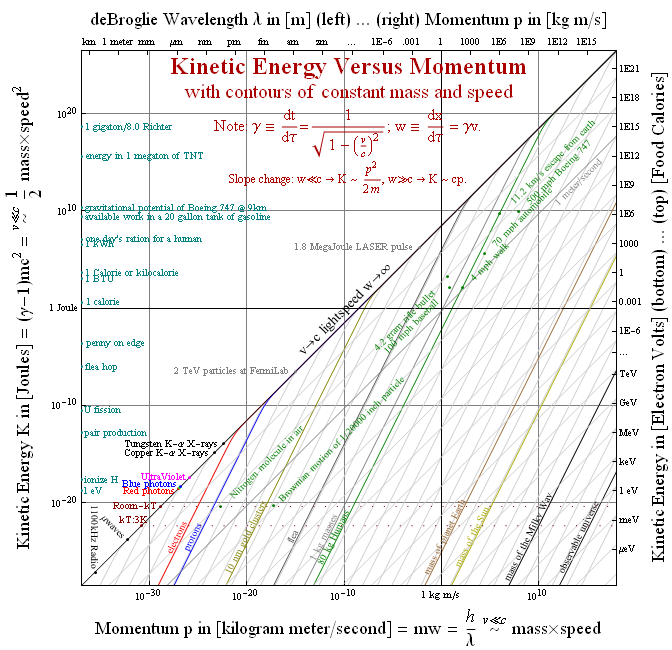 Check out these 20 Nov 2007 notes for intro physics students on what their course might NOT be telling them about cool stuff you can do with vector products, and this plot of kinetic energy versus momentum that includes everything? Here are some 9 Apr 2007 notes on natural units for magnetism, inspired by the concept of proper-force as a tool for visualizing the anyspeed connection between ma and dp/dt. 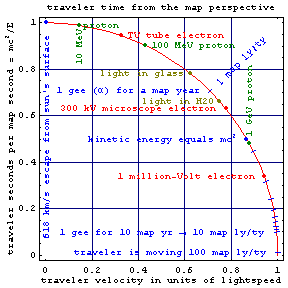 These 20 Jan 2007 modern physics notes for a how things work course illustrate the circular tradeoff between motions through time and space, and link to anyspeed dynamics plots and calculators. Here's the 14 June 2005 upgrade of our note on making the most of ``one-frame concepts'' first in teaching kinematics, and a ``map-based mechanics'' derivation of Biot-Savart (illustrated using the frame-invariant proper-force) for comparison to the multiframe derivation here.